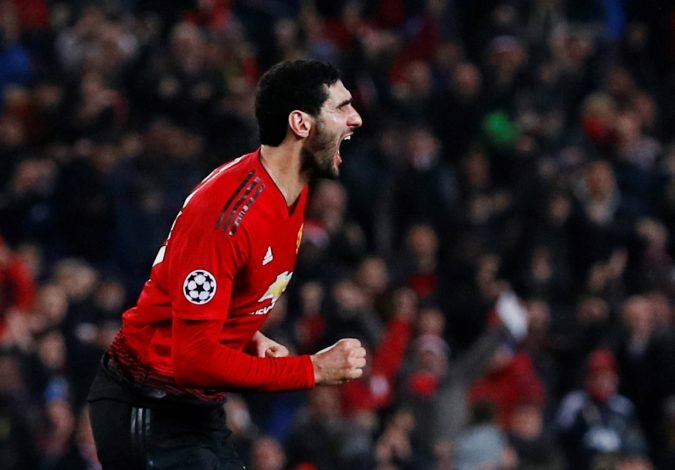 Marouane Fellaini was once again the saviour for Manchester United, as his late goal helped the home side clinch a crucial win and effectively qualify for the knockout stages of the UEFA Champions League. Jose Mourinho fielded a controversial starting lineup despite his side’s recent results, as the team sheet shaw Marcus Rashford replace Romelu Lukaku up front, and Marouane Fellaini occupy the spot of Paul Pogba. The Red Devils were largely wasteful throughout the game, until the Belgian midfielder came up with the all-important injury-time goal in the 91st minute. However, it’s not just the goal that caught the attention of one and all, as Fellaini was also involved in a hilarious incident even before the game kicked off. While the two sides were still in the tunnel, preparing to come onto the pitch ahead of the match, the cameras panned towards a confused Fellaini, who appeared to be searching for something. As it turned out, the 30-year-old had lost his mascot, and he was frantically looking for the young child whilst making his way onto the field. After the 1-0 win, Fellaini once again stood out during his post-match interview as well, wherein he dismissed the claims that suggested his goal should have been ruled out due to handball. “I think it was the right moment to score a goal,” said the midfielder.